I love my commercial Vita-Mix Blender at Aroma Thyme. I am convinced that it is the best blender. I have had it for 10 years, yes 10 years and we abuse it. We use this blender at least 10 times a day. 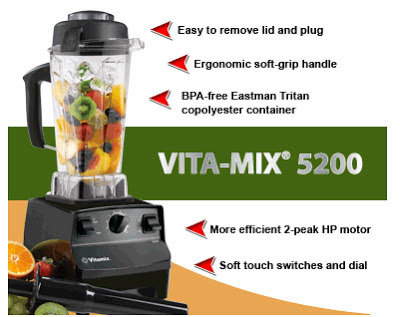 Yes, we have used this Vita-Mix blender around 35,000 times and its still going super strong. It is an awesome versatile machine. But you don't need that machine at home, and here is why. Vita-mix makes two levels of machines, a home version and a commercial one. There is no real difference in performance. It's the same motor, same blender just a different color. Here is the main reason you don't want the commercial version. The home version has a way better warranty. See Vita-Mix knows that us chefs use abuse these blenders. We throw them, drop them, use them for extended amounts of time. So Vita-Mix gives us chefs a fraction of the warranty. The home version is the same horsepower as the commercial. The home version has a way better warranty. I am 100% convinced that this blender is the best one on the market in that price range. Before you say that this blender is too expensive just keep reading. I know I have gotten my money out of mine. In fact, at the current rate it has cost me one cent each time I have used it. That is an extreme bargain. My home blender, another brand, was a fraction of the cost. But it has cost me way more per use. I am on my second blender at home. I have ordered lots and lots of replacement parts. And now they don't even make the replacement parts or the blender anymore. Guess what I am treating my self to this holiday season, a new Vita-Mix blender for the house. Check out these incredible blenders on the Vita-mix website.